All three suspects in the Captain's Bakery incident are described as being; 5’5” in height, slim build, dark complexion and had their faces covered by white cloth. 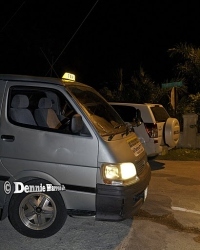 Although no weapons were used during the incident and the driver did not see any weapons the police were not ruling out the possibility that the incident wasn't linked to the shooting which occurred at the jerk chicken stand by the Drama Society. Anyone with information about the crime should contact George Town police station on 949-4222 or the confidential Crime Stoppers number 800-8477 (TIPS). I am sympathetic but the taxi's have been robbing me for years. Increase in crime blame it on garrison politics, unemployment, bad parenting, breakdown in society, imported criminals and most of all THE MASS STATUS GRANTS! Someone post on CNS sometime back that crimes goes in cycles I am suggesting Mr Baines should try and contact the writer to get some expert advice instead of listening the intelligently aggressive drivel coming from the Police talking heads they do not have a clue of whats going on. Time for a special task force to be brought in to "clean up". Another special task force, real tired bro give it arrest too many specialist in the RCIPS now no real Policemen anymore. I mean a REAL task force – not like those that were brought in previously. One that is aggressive and mean business – not like our "intelligently aggressive" police. I agree but don't hold your breath as the Commissioner and Premier believe crime is on decline according to some convenient statistics. If we do not import a special force, one with the knowledge,and training on how to fight these criminals, we will loose these Islands. Why do we think we have to sit and wait for our citezens to come forward with imformation, and put them at risk and danger, they have no authority to fight back, whenever these criminals learn who squelled on them. If our local security service do not have the intelligence to observe, question and interrogate these suspected criminals, then we must import one that can…simple!. Even if we have to get rid of the human rights, they have already screwed up the world. What, they've switched over to their summer masks? Sounds like a robbing SPREE* these 3 masked men went on last night! what's going on with this place?! I guess the criminals are living up to the old saying,try,try,try until you suceede.The time to stop these criminals is now. Citizens of these islands, get up and stand up shoulder to shoulder,look out for each other,report crime,start a chain call and tell a friend about every suspicious activity you observe,friends pass it on alert the entire island one person to person,one call at a time,be on guarde,stay low and watch each others back. This is total BS I wish Marlon Bodden would stop talking crap and get his officers off there lazy behinds and start to doing something about all these crimes if not the people is going to start doing something. These crimes are out of hand and there is nothen being done about it besides a lot of hot air. OBVIOUSLY, YOU'RE NOT ARRESTING THE RIGHT PEOPLE!